TI wrote this post as a member of the Guest Design Team at Flamingo Scraps and wanted to share it here. Like just about everyone else, I'm scrapping on a budget. One of my favorite ways to stretch my supplies is to use one piece of double-sided paper to accent a layout and then create a set of four coordinated cards. Here is the layout I made for Flamingo Scraps' “Read Between the Lines” challenge. As you can see, I only used ½ inch of the striped paper (Violette Wings from Webster's Pages) as an accent on this layout. I made four cards using the remaining 11½ x 12 paper. The first thing I did was carefully cut out the two butterflies that are on the reverse side of the paper. 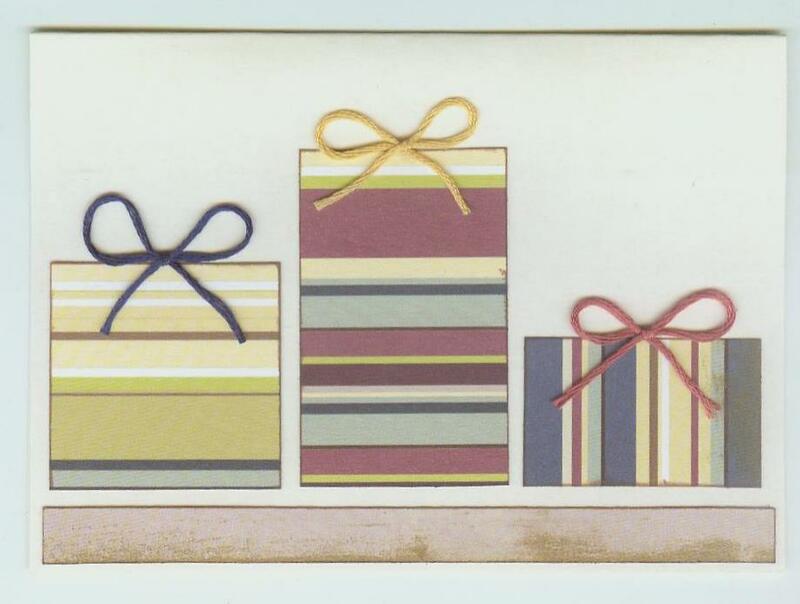 Next, I cut three rectangles, approximately 5¼ x 3¾, to use as the bases for three of the cards. 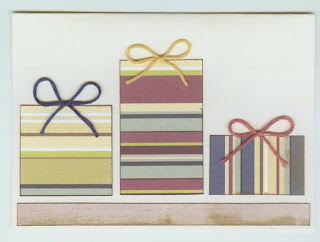 I cut the remaining large scraps into a variety of sizes of small rectangles to use as tags and other decorations. I kept all the tiny scraps set aside. Next, I got out my ribbon tubs to dig around for a scrap of ribbon that would coordinate nicely with the paper. I keep long ribbon pieces rolled. The short pieces are just jammed loose into the tub. Perhaps not the best system, but it works well for me! I found a 6 inch piece of maroon ribbon that coordinated perfectly. I also pulled out a few scraps of embroidery floss. Finally, I got out a few brads, my favorite ColorBox chestnut roan ink, pop dots, a paper piercer, a corner rounder, and some cute Fiskars stamps. I inked all the edges of every piece of paper. With all materials prepped, I was ready to begin. 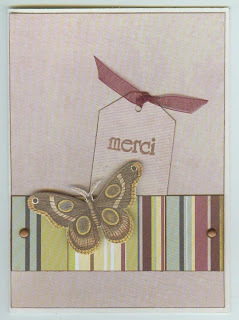 For my first card, I used a solid lavender background, and layered a 1½ x 3¾ striped rectangle over it, adhering only the bottom portion to the background. I used two brads to secure the sides, thus creating a pocket to hold a tag. 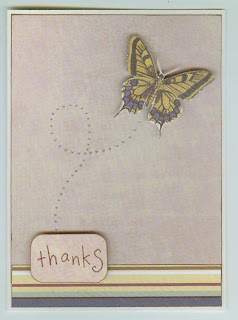 A quick stamp, piece of ribbon, and a popped up butterfly and the card was done. 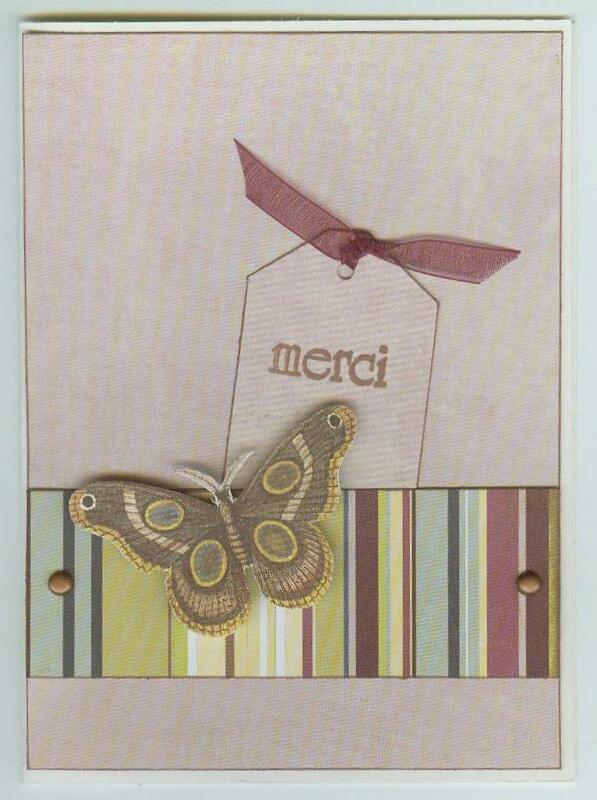 The second card started with a solid lavender background, over which I layered a small striped strip. 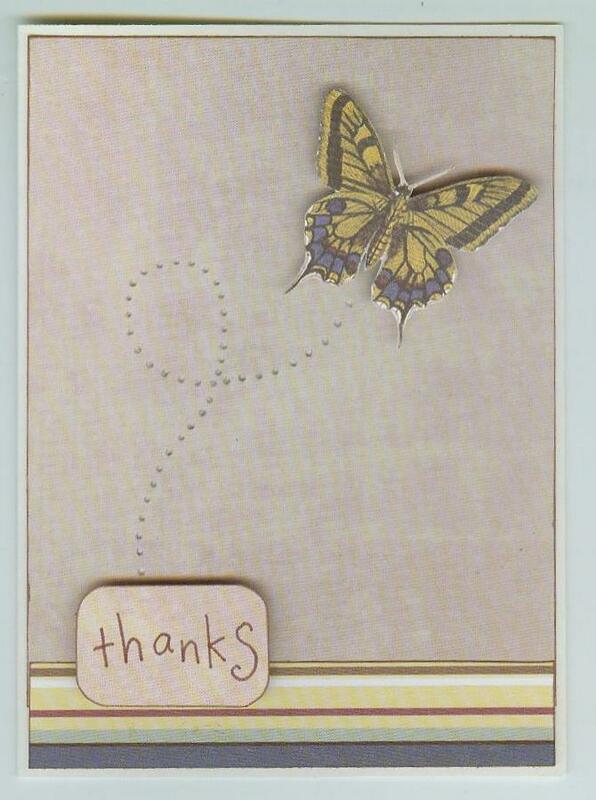 I popped up the butterfly, then used the paper piercer to punch holes showing the path of the butterfly. I finished the card with my message written on one of the tiny scraps I'd saved. 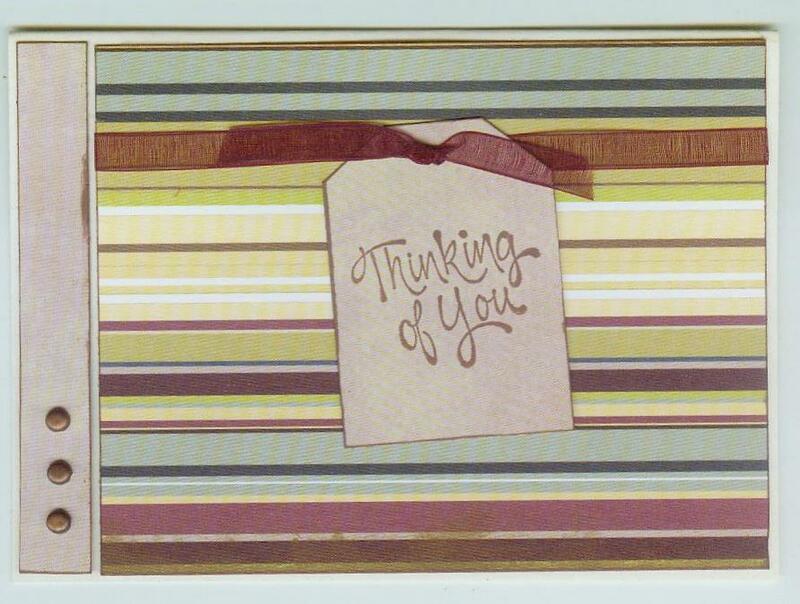 For my third card, I used a striped background, a small solid rectangle, and another tag. That was the end of the maroon ribbon and large rectangles. 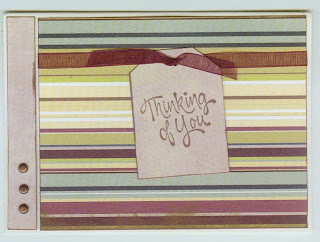 With no more large background rectangles available, I adhered three different sized rectangles directly onto the card blank. I used the last lavender strip across the bottom and topped each rectangle with an embroidery floss bow. I definitely feel like I got my money's worth out of this single sheet of paper!